Sopron is one of the cities with the most number of monuments in Hungary. It is located along the Austrian-Hungarian border at the foot of the Alps, 220 Kilometers away from Budapest, 60 Kilometers away from Vienna. There are a lot of attractions in this city: quiet little streets of the historical city center, unique buildings and monuments of the Middle Ages. Citizens of Sopron are vary famous for their hospitality and loyalty to their city, and rhere is a vivid life in the city. The traditions of art are nearly 70 years old in the city, and the Sopron Festival Weeks are organized every year. Other tourist attractions include Spring Days, professional exhibitions, Sopron Wine Festival, Pan-European Meetings and other events. As a result of the natural surrounding of the city, the mountainsides with woods, the lookout towers, springs and the air of the Alps make Sopron an ideal place to visit when looking for mental and physical recreation. The Lővérs, the nicest recreational area of Sopron, is situated south of the city. The area is also famous for its wine. In downtown Sopron, near national monuments originating mainly from the medieval period and near palaces, you will find the city's newest accommodation, the Hotel Civitas. The hotel offers broad band internet services, LCD televisions and suites which are equipped with the most modern lock systems, all of which meet the modern comfort and safety expectations of the XXI Century. The Palatinus Hostel, that is one of the well-known Hostel of Sopron, is waiting for its dear guests. You can find the Hostel in the best part of Sopron, in the middle of the historical city-center, that gives an opportunity to those also, who are only visiting for business to visit the city. Continuing in the traditional vein of hospitality, Sopron's most notable architect designed the present building which was named the Pannonia Hotel in 1893. "Window to Town" - Hotel Sopron**** is a unique place combining the international standard of services and the Hungarian hospitality. The Hotel Wollner is the newest hotel in the historic inner town of Sopron. With the atmospheric inner courtyard, the hanging garden, the vaulted rooms the almost 300 years old palace built onto the medieval fortress wall conjures up the old Sopron. Sopron is not only Hungary's gate to the West, but also one of the most beautiful towns of the country providing a marvellous atmosphere, showing its unique and individual face of every season. Our hotel is situated in the most quiet green area "Lővérek" of the town with rooms overlooking the woods. If you are on a business trip, attending a conference or simply wish to relax in the "city of loyalty", Sopron, our modern and comfortable Pension Mandarin is the ideal choice for you. Would you like to spends a couple of days in a pleaseant, peaceful enviroment? The Villa Sakura is waiting for You! The pansion has got its name from the Japanese cherry trees surrounding the street, which gives a unique experience for the visitor at spring, by the time of "cherry-blossom". 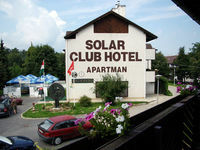 Solar Club Hotel is located in Sopron, in the small city we use to call the Jewell- box of Transdanubia. The hotel is situated in the recreation area called Lővérek, above the old downtown. This is an ideal place for transit travellers or taking holidays as well, guaranteed by the high- quality services. City Partner Hotel Szieszta***, the largest hotel of Sopron is located at the foot of the Alps, at one of the most beautiful points of the Lővér hills, 15 minutes distance from the town centre, in the middle of a beautiful five-hectare natural park. The hotel has 273 Classic and Standard Plus rooms (with bathroom: bathtub/shower) with balcony.